Ask a geek how to fix a problem you've having with your Windows computer and they’ll likely ask "Have you tried rebooting it?". This seems like a flippant response, but rebooting a computer can actually solve many problems. Whatever, you may have your own reasons to restart your computer, in this article we'll show you how to restart it using Python. pywin32 installed on the machine of execution. Install the distribution that works with your version of python and windows platform (x86 or x64). However, for some windows users this solution doesn't work correctly. To prevent any incompatibility, we will work directly with the win32api which allow us to achieve our goal. As mentioned in the requirements, you need to have the pywin32 installed on your machine to prevent any error at execution. # Get the ID for the system shutdown privilege. # Now obtain the privilege for this process. # Create a list of the privileges to be added. # Now we remove the privilege we just added. 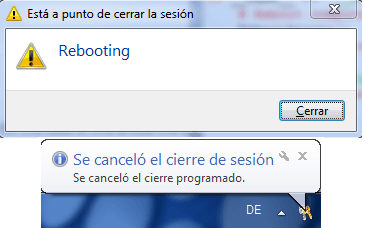 The 2 main functions will be RebootServer and AbortReboot. The AdjustPrivilege will grant the required permissions to reboot the system. Note that the RebootServer function has a timeout of 30 seconds (The computer will be restarted after 30 seconds), change it if you need to. Restart it in 30 seconds. Abort the reboot after 10 seconds. As the code talks by itself, now keep working in your project, have fun !